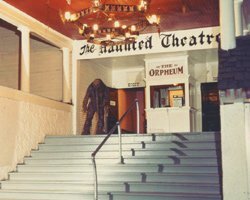 Welcome to the Haunted Theatre! Not a theater of movies, But a Haunted House of three dimensional monsters. Within these halls you will encounter horrors of the past…Artist’s conceptions of Monsters from Mackinac’s History. Come join us for some good old-fashioned screaming and laughing. We are not like a Halloween Haunted House. We are more sophisticated and creative. We customize the scariness to fit your age group. We can terrorize, but we can also, gently hold your hand while we walk you through. You decide, but do remember that first and foremost we are a Haunted House. We want our customers to have a fun, laughing, screaming experience. Our price is $7.00 for everyone. We do special rates for large school groups. We discourage age 6 and under to enter. Pets are welcome. Half price for senior citizens. Military are totally free. We do special pre-arranged group time situations……like midnights. We aim to please. We are usually open from 11am to 8pm. Questions? Feel free to call (231) 818-0527.